← Crucifixion – Abandoned? Betrayed? 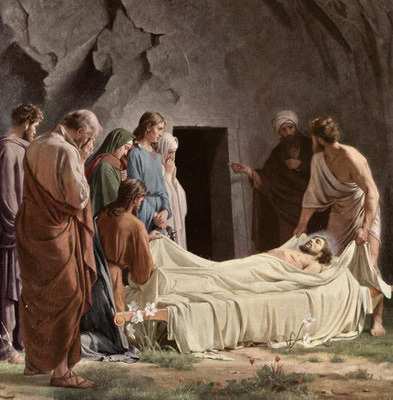 Holy Saturday — An Intermission… the space between the tremendous drama of events in the past two days, and the unknown of Jesus’ promise of something more dramatic three days after His death. We have spent these days walking alongside, or a little behind, the Disciples Party as Jesus directed them into Jerusalem for the Passover. It is regrettable that the vicissitudes of history, politics, and economics have so divorced Christian worship and rhythms from our Jewish roots. Easter is inextricably woven with the Passover, the dramatic high points of Jesus’ ministry are woven with Passover, but unless we are blessed to know and have walked with Jews in our time who love and worship God, we can easily miss all these connections. Across this day, this quiet day, I have been steeped in the awareness that today I “celebrate” or “commemorate” Death. Not “the dead”, as in the Feast of All Souls or All Saints. And not “Dying”, as in Good Friday, and the Lord’s surrender, willing surrender, to becoming sin and letting darkness come that He might pay the price, collect its wage. But rather, this is the aftermath. This is the silence after the tumult. This is the grief. This… is the Death. We are disciples, you and I. At least I know that to be true for myself, and for those who have corresponded with me from these pages. We seek eternal life… we have it, and we seek to comprehend it, to cooperate with it, to serve Him… “This is eternal life, that they may know You, the only true God, and Jesus Christ whom You have sent.” [John 17:3] I don’t know about you, Gentle Reader, but as we approach Easter, my heart seems to settle its pulse into synch with His Companion Disciples, and vicariously I experience much of what I suspect I would feel had I been there and then. And today… today… just seems to be such a “trembling” day. Were we walking with the Companions, we’d have watched our most terrible nightmare come about. Our Master, Our Teacher, now Our Friend… God, Son of God, this incredible Rabbi… the Messiah from whom we expected such great things… arrested, shamed, tried, condemned, rejected by the multitudes in favor of Barabbus of all people! Finally stripped naked and crucified with criminals! And our fear rendered all but the most loving of us… fugitives. We melted away from the crowds, and fled for safety and cover. Only the women held the faith. The women who traveled with Him from the beginning, who supported Him with their means, who wiped His feet with their tears, and His bloodied sweating face with their clothing as He stumbled along on His last Journey to the rocks where He would be slain. Are we ashamed of ourselves. we burly Companions, we whom He authorized to travel in His name, heal the sick, raise the dead, cast out the demons, as we see these mere women with the courage to stay alongside Our Lord, where our fear of death turns our knees to water and we slink away to melt into anonymous crowds and shelter? Yesterday, the Day Jesus Died, was an incredible day of such fear for us! Fear, confusion at what was happening, and Death! When He was taken down, two men stepped forth and did something unthinkable. They were, of all things, Pharisees. Here we are in the Passover, about to enter the Sabbath of the Passover, for which we have spent 5 days of purification and cleansing and preparation… and, as Jesus is lowered from the Cross as a corpse… these men (Nicodemus and Joseph) gain permission to take custody of the body and lay it in a new cut tomb. Now, publicly, they have become Unclean. They cannot enter the Temple to worship. They cannot sit to the Passover. They cannot traffic with their peers or those they lead and teach. They are now no better than lepers in their community… not until they have purified themselves from handling the dead. They, these religious men, must come and deal with Jesus’ body first, washing him of the blood and the filth, restoring His modesty and dignity, before the women can come and anoint Him with herbs and ointments for proper interment. There is no time! There is so little time! Unclean or not, women or not, they must all be back to their homes before the sun sets. So it is a hurried job to prepare the Lord’s Body to be sealed up, until the Passover Holy Sabbath is past, and they can return to the Tomb. They do their best. He is washed, anointed, and wrapped in a winding sheet. Sadly, they all leave Him. The stone is rolled into the entrance to seal His grave, and they all go home. Now… there is nothing to do… but wait. So here we are… waiting. Nothing to do. Nowhere to go. Just the waiting, feeling the grief, feeling the confusion, feeling the fear. Jesus… is Dead. It seemed that my focus, so tight and intense on the Cross, the Tomb, Jerusalem of that time… “panned outwards” to a visage of the region, the hemisphere, the globe, then onwards out beyond the solar system, galaxy, to encompass all of the universe before me… and all of that… ALL of it… stood poised and silent… frozen in the reality of the Death of Him in whose hand all of this was held together. It was like inhaling, and being unable to exhale. It was a sense of “trembling anticipation”. This… is a miserable feeling. Don’t you agree? That sense of “this is terrible”, but “something else is fixing to happen”, but “I don’t know what that is”, and “I don’t know if it will be better or worse”. It’s the pain of the present, combined with the fear and uncertainty of the future! Where I sought that the Lord would RELIEVE my discomfort, I was surprised that He seemed to INTENSIFY it, MAGNIFY it. I knew He was in charge of whatever He was doing, so I did not resist. But it was to be totally immersed in Death, the full experience of the grief, the pain, even the texture and odor. Not pleasant, as learning experiences go, but I could sit still. Now I, Gentle Reader, like most people I know, have a natural revulsion and aversion to death. For many years I despised and “fought” it, feeling a a personal sense of defeat when someone in my care succumbed to death. As I matured, I came more to “accept” death as a necessary transition from here to There. But I still didn’t “like” it. At this point in my walk, I have come to realize that there are times when Death is a welcome relief and release from the intense labor and suffering of captivity in this body. But I cannot say it was ever something I “embraced” with my heart. That was the challenge of this day. The Lord challenged me to “embrace” Death altogether. So to enter into Him and His heart, that I could see that He did so… and allow the Him in me to do so again, and take me with Him as He did. Does this sound strange to you, Gentle Reader? It certainly did to me. After spending an entire day “immersed” in Death… the Lord now asked me to “embrace” that as wholeheartedly as I did Life, Love, or Joy. It made no sense! I could not understand or comprehend this. Still, clearly, He had done this from the Cross… there was nothing to this directive that seemed inconsistent with Him or Love or scripture. So, given that I’ve found “faith” to be my willingness to embrace a truth I could not comprehend… I obeyed. I endeavored to “relax” in the immediate intimate presence of death itself. Like learning to “float” in water, it’s not an application of effort… it’s the refusal to apply resistance. It crystallized into ceasing to judge “Death” to be “bad”, just accepting it as a part of the experience of life God grants to us, and thanking and praising Him for making it part of our lives. The very strange instruction to my heart seemed to be to: “Trust Death”. Strange, no? After yielding into the stream that the Lord seemed to direct, some interesting truths seemed to become apparent. I don’t offer these here as “grand answers to mysteries”. It is all yet quite mysterious to me, but I offer “food for thought” here, as we have spent this extraordinary day… rather like Noah and his family shut up in the Ark, sealed in, days before the Flood began… just waiting… waiting… on a promise… confused… in a box. 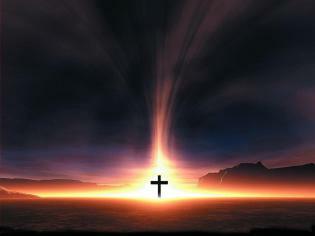 Jesus did not refuse the Redemption in that He did not refuse or flee from the Death that came for Him. He embraced it. He surrendered to it. He trusted to it, that the Father (who He could no longer feel, hear, or sense), was Sovereign over all… and He could trust to that. Jesus indeed had exercised authority over Death many times in His ministry… but not today. Here, the truths of this passage, seemed to be where my ponderings brought me.I realized a simple series of things:The great “Tyrant” of our lives, the force that impels people against faith and into selfishness stems from the apparent power of death. Not so much death itself, as the FEAR of death. To acquire things, to bully others, the lie, cheat, steal, kill… all seems to bolster an illusion of our invulnerability, our potency, our power. Why do we need such things so desperately? Because they meet our deepest insecurity… the knowledge of our mortality… and our fear of everything having to do with that. Humans not only fear death because of the implications of the Afterlife… but because of revulsion to Death Itself! He SAYS, simply, “you must die to live.” He instructs His followers to let loose their fear of death, embrace it, take up their cross and follow Him. At the Last Supper He instructs His to eat His body and drink His blood, by which He has earlier taught they will have life within them. Then, Jesus MODELS His teaching. He surrenders to Death, laying down His life of His own initiative. Today, this Silent Day Between, it is ever so tempting to sneak a peek forward to the rising of tomorrow’s sun… to “borrow forward” into tomorrow’s joy. But if we can refrain… if we can hold our self control… an incredible thing happens right here. People are bullied, their whole lives long, by the FEAR of Death. What if we lost that fear? What if we could embrace the whole issue of Death as one the Lord absorbed and now rules, that we are to embrace it, in all ways, in order to follow Him? What would it be like if the greatest fear in our personal universes, just evaporated? What if we simply trusted Him? Would we find it easier to LIVE in and for Him, not just die? Would we be less shy in our communities about our love for Him, or His for us? Would we be more loving, more giving, less attached to our material possessions? Would we be less concerned about “what other people think?” of whether we are keeping all the rules, and be more attentive to the hungry, the sick, the incarcerated, the sinful? I’ve said before, we cannot fully love anyone we do not fully trust. As long as we see Death as a thing apart from Him, apart from His love, but yet present in our lives… can we fully trust or love Him? And what happens when we release that? Were the First Century Christians so extraordinary because they had seen with their own eyes, and lost entirely their fear of Death? Could they openly follow Jesus into the joy, the light, the love, the power of the Holy Spirit, because they had lost all fear of death, persecution, or the power of the state? What would our days, our walk, be like if we could do the same? It was interesting to discover that the person who is the most free on the face of the earth, is the one who has no fear of death. I have to wonder if that explains a great deal of “historic revivals”, when entire regions or cultures are changed when a people discover their freedom and Life in Christ. Holy Spirit, yes. “Magic”, no. Holy Spirit inspires the discovery of freedom and Life in Christ. I consider our being freed from the fear of death through Christ’s death on the Cross a matter of HIS grace to us… but I suspect that both He and the Holy Spirit are willing to “share the credit” without too much squabbling before the Father. As to “man”? We just benefit from and can respond to the grace or refuse it. Not much “action” involved there. LM what a refreshing journey is here. “What would it be like if the greatest fear in our personal universes, just evaporated?” Love and fear are not good bedfellows. Remove that fear (and as I read the picture do stopping for a cuppa came to mind – death simply being a pause of normality) and eternity steps a little closer. And we step closer to our God. I find it astonishing, and more than a little humbling, to quietly discover how much of my life… how many of my decisions… are influenced by one or another form of fear. And this is the biggest and most powerful.